Anchor Systems (International) Ltd offer bespoke training packages for our entire product range including the Anchor Post and Vulcan Earth Anchor® and their respective applications and uses. Training can either be carried out on-site or at our Head Office in West Sussex near Gatwick, and can be tailored to your specific requirements. 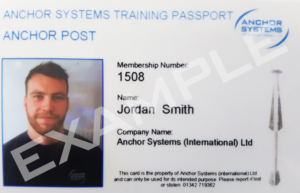 At the end of a successful training session, each trainee will be issued an Anchor Systems training passport detailing the completed competence on the back of the passport – similar to a British driving licence. 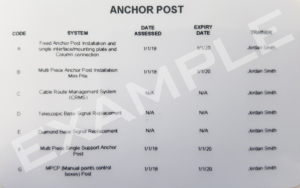 The Training Passports are monitored regularly, by Anchor Systems, regarding the renewal dates for each competence. The training session is finished off by reviewing your bespoke project requirements and discussing how we can assist you further. Any further questions you may have can also be discussed at this stage. Details for your training passports are checked and will be sent to you by post.